Visão is a powerfull desktop software that allows to process and analyze large text data. With regard to your aims and plans, this application makes possible to design fully-customizable flows to manipulate and transform your data into a desired shape or to perform a statistical analysis. Visão is mainly focused on computer-aided text analysis, therefore it supports various encodings, dictionary-building, regex patterns, and many other important features. Visão may be sucessfully involved when it comes to custom patterns quantification. Use regular expressions or a dictionary to specify the domain to be quantified. Select the input files and functions to pre-process the input, choose methods to compare tokens, and select how to format the final output. You do not have to know a sophisticated language, just use the graphic representations to visualize the whole process fast and easily. Finally, click "Run" and Visão will do the rest, no matter how long it takes. It is up to the user how the text is going to be processed. Choose an appropriate function, set up its parameters, and continue building the model. A functions library contains essentials and advanced tools to fulfill your needs. 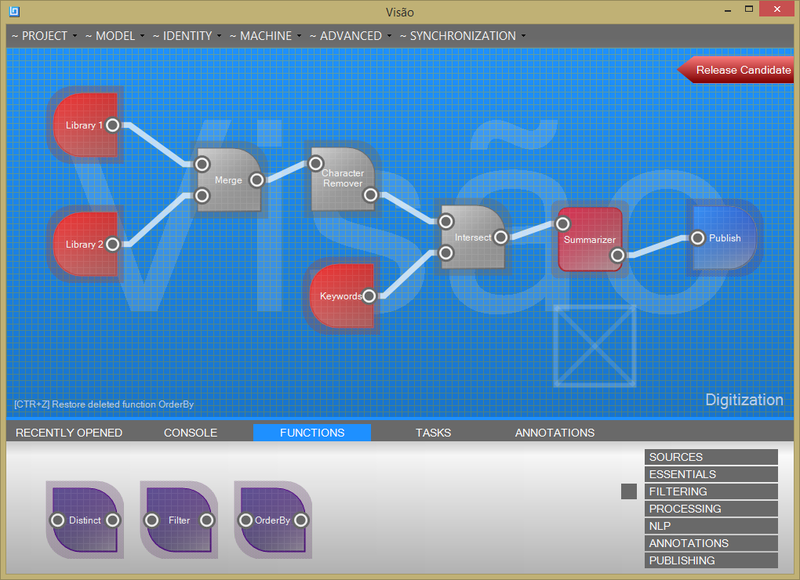 A mature version of Visão will be released in the fall of 2015. Contact us for more information.